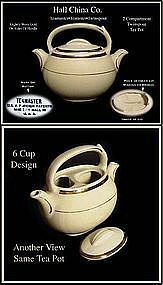 1950's Teamaster twin spout, 2 compartment gold decorated, ivory tea pot made by The Hall China Co. Great condition except for a manufacturing flaw on the underside, inner lip of the lid. Have seen many other lids like this. Tiny bit of gold wear on handle.